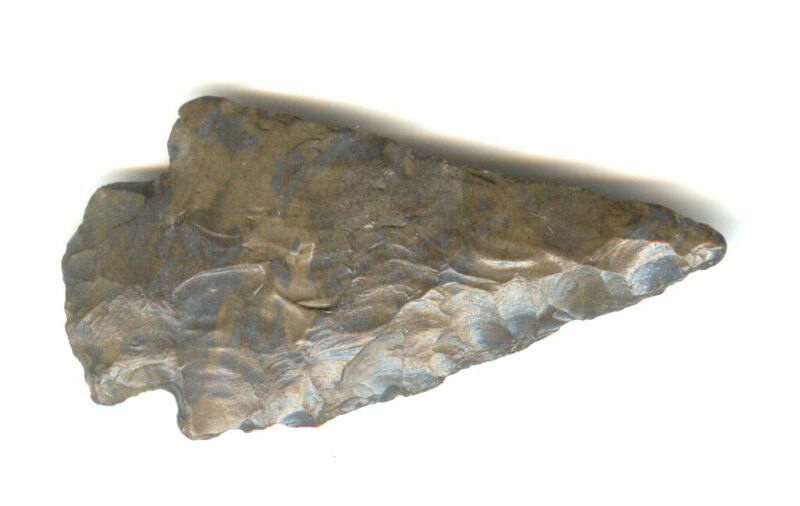 A Small, Thin, Colorful, Visibly Aged And Anciently Use Sharpened, Nicely Flaked Scottsbluff Point That Exhibits Surface Sheen And Overall Stone Coloration Aging Patination, Correct Rolled Basal Stem Edge Hafting Dulling, Correct Early Style Blade Flaking, Heavy Aged River Polish, Aging In The Basal Stem Corners, Correct Material And Manufacture For The Area Found. Found Near The Arkansas River, In Tulsa County, Oklahoma. Ex-Lonnie Hartline Collection. Repeated Use Sharpening Has Reduced The Length And Width Of The Blade. This Example Is Thin For The Type, Displaying Heavy Use. Includes A Ken Partain Certificate Of Authenticity.